Supplication: Selected Poems of John Wieners (coedited by myself, Joshua Beckman, and CAConrad) is now on presale from Wave Books. The gilded limited-edition hardcover (pictured above), beautifully designed by Jeff Clark, is currently available for a mere $20! The book officially publishes October 6. 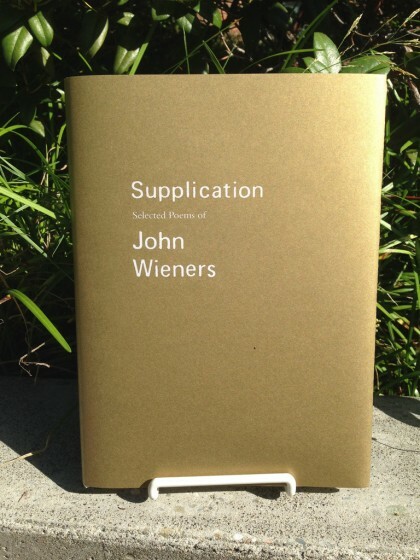 Supplication: Selected Poems of John Wieners (Wave Books, 2015) is the first comprehensive volume of Wieners’s poetry to appear for nearly thirty years. Providing a chronological account of the transformations of Wieners’ writing from the mid-to-late 1950s into the 1980s, and restoring a significant amount of material into print, Supplication provides a fresh perspective on Wieners’s eclectic and idiosyncratic oeuvre, spanning the range of affective extremes that Wieners produced in verse. The crescendos of visionary poetics, and its subsequent collapse into romantic desolation, with the nuances of queer desire and embodiment, are distilled finely into two hundred pages. Publishers Weekly has also named Supplication one of the three “Most Anticipated” poetry titles of Fall 2015.